We're out behind the church. In the graveyard. Norman is looking around like he's afraid he's being followed. I nod, "Nice. I like this. Lotta room for more dead people here, though. What say we fill this place up?" Norman turns to me, "Look. This is a bit tricky, but warlocks are sort of outlawed a bit." "Technically it's more frowned upon than outlawed. 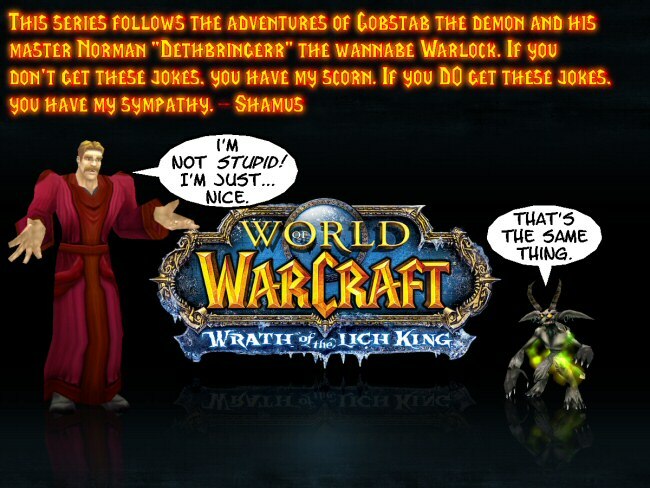 But the point is, people might give me a hard time about being a warlock if word gets around." "Ah. Gotcha. But wait. How do you explain me? You've got a demon by your side. That's gotta be some kind of giveaway." "Everyone sort of thinks I'm a mage. It's a long story. The point is, if anyone asks I'll just say you're an elemental or something." 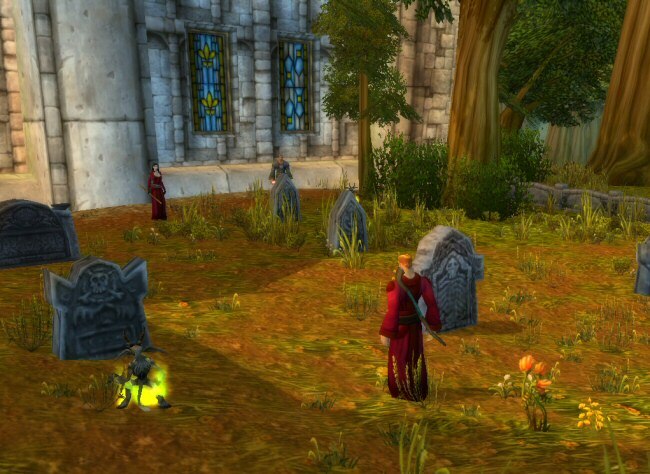 "This still doesn't explain why we're in the graveyard." "That's the other problem. Drusilla over there is my warlock instructor. She doesn't know I'm good." "Buddy, I've seen your magic in action. Nobody is going to think you're any good." "No, I mean they don't know I serve the Light. They think I'm evil just like them." "And they think this because ... ?" He sighs and looks over towards his teachers. Then he lowers his voice, "Part of the initiation is you have to do some ... stuff. Bad stuff." "I don't want to talk about it. The point is, these guys think I'm evil and I don't want to mess that up or they won't teach me anymore. So I order you not to say anything." "You don't have to be like that. Believe me, the last thing I want is to do something that will make you less powerful." Norman gets few lessons in sucking 1.3% less, and then we head back out to the front of the church. Back to Marshal McBride and his team of decorative town guards. I nod towards the deputy, "So we're back to getting screwed by the these guys? What job will they give us this time? Polish their armor? Fetch them ale? Fight off an invasion while they supervise?" "Look," Norman says defensively. "These guys might be a little lazy, but if there was real trouble they would be ready for it." "The Kobolds weren't real trouble?" "Kobolds are beneath them. But if there was something bad ... "
"Yes! Exactly. If bandits came around these guys would be on the job." "Here's the deal: If these guards have sensible work for us, then I'll tell you a secret about myself that I've never told any mortal before. If they have us do something crazy - like kill bandits - then you gotta tell me what you did to get into the warlock's union." Norman stands up straight, "Mother always says that gambling is wrong." "It's not gambling if you really believe you're right. Are you saying you think these guys are just as shiftless and corrupt as they seem to be?" "No! These are good men. Decent men. I'll take your bet, demon."